Haslet is a city in Denton and Tarrant counties within the DFW Metroplex in the U.S. state of Texas and is located 15 miles north of downtown Fort Worth and 20 miles south of Denton. Haslet borders Interstate 35W, U.S. Highway 287, and Alliance Airport. The area was settled around 1880, but it is likely that no distinct community formed until 1883, when the tracks of the Gulf, Colorado and Santa Fe Railway were extended through the area. A post office opened there in 1887. 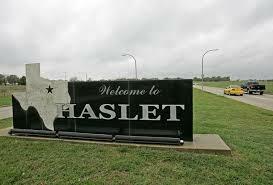 The community was named for Haslett, Michigan (Note the spelling with two "t's"), the hometown of the railroad's contractor. Considered a major intermodal hub, Haslet has an excellent transportation and distribution network via major highways, BNSF Railway Intermodel and Alliance Airport. DFW International Airport is 30 minutes away. Amazon Fulfillment Center is the newest member of the corporate presence in Haslet. Employing 1,000 people, the Amazon Center opened in October, 2013. The 1.1 million-square-foot Haslet center handles small items like books, small electronics or DVDs, to name a few. Academy Foot and Ankle Specialists proudly serve the people of Haslet. We want to build good rapport with you so that we can work together in finding the best solutions available for your podiatric needs at a location convenient around the Haslet area. Call us at 817-424-3668 (FOOT) or keep exploring out website to learn more about our services, facilities and payment options.